The first clue to the extensive technology incorporated into Mercedes’ flagship was the unusual pre-launch press kit with a note attached that advised one to "view the video before you come to the press introduction." Ahem. Clue No. 2 was the 300-plus-page owner’s manual, 200-plus-page COMAND system instruction book, various supplements, a professionally produced video, and an 84-track instructional audio CD, all tucked into the glove box. The S-Class demands enough books and manuals to make small town libraries envious. What, no Cliffs Notes? In the end, the extensive research before driving the S-Class may be worth the trouble. With classic styling, the newest technology, and unprecedented safety features, the new S-Class is a class apart from other luxury sedans. Based on customer demand and expectations, only long-wheelbase models will be offered in the United States. The S430 with a 275-horsepower 4.3-liter V-8 will sell for $69,700, while the 302-horsepower S500 with a 5.0-liter engine retails for $77,850. A new generation V-12 is expected to arrive for the 2001 model-year. In an attempt to make luxury-car buying less stressful and more enjoyable — and to ensure consistent per-vehicle profits for retailers — Mercedes is encouraging non-negotiable pricing for this model. Whether you like it or not, it may become reality for all future Benzes. No matter which version, the new S-Class teems with mechanical virtue. The sleek design, slightly shorter and narrower than the previous version, offers more leg and head room for the occupants. The use of aluminum, magnesium and other lightweight materials lets the new model weigh in at 500 pounds lighter than its predecessor while still improving upon safety and spaciousness. Both versions come with a "sportshift" transmission: A clutchless, Tiptronic-style automatic transmission option allows the driver to upshift or downshift with a slight movement of the wrist — a must for those who feel a manual transmission is a necessity. Besides engine offerings, slight differences separate the S430 model from the pricier S500. 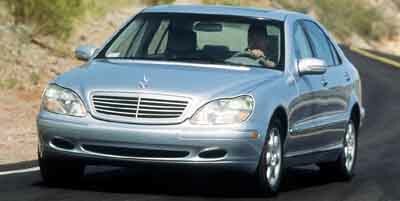 Standard upgrades on the S500 include Xenon headlamps and Nappa leather seating with front-seat heaters. Wood trim is standard, but the S500 has the upgraded burled walnut trim, whereas the S430 offers only eucalyptus wood. Our test car, the S500 model, was equipped with all with the bells and whistles — rather, fiber optics and satellite technology — that one could ask for. Safety and technology go hand-in-hand where Mercedes is concerned, and the new S-Class has the best of both. For starters, the sedans are equipped with eight airbags: dual front airbags, plus a door-mounted airbag on each door and a pair of 6.5-foot-long curtain-style airbags that deploy from the headliner and extend from the A-pillar to the C-pillar. In addition, the new "smart" technology uses a two-stage activator that inflates the airbags according to the force of the impact. When using a BabySmart compatible infant or child seat in the front, the sensors are able to detect the carrier and automatically disable the front passenger-side device. Another first for Mercedes is the use of laminated glass for the side windows. 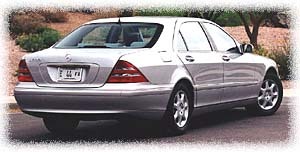 And, of course, anti-lock brakes with brake assist, traction control and Mercedes’ ESP (electronic stability program which uses selective braking to correct sliding and slipping) are all standard features. 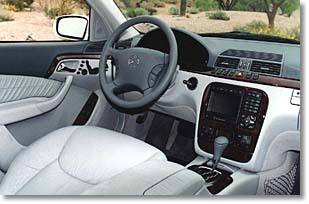 he S-Class' interior is stuffed to the gills with techno features like smart cruise control and Benz' unique Brake Assist. Another innovative high-tech option will be Smart Cruise Control. Although not available until the fall of 1999, this may be worth waiting for if you need to have the best of the best. With Smart Cruise Control, the driver simply sets his cruising speed as well as a minimum distance that he wishes to be between him and other vehicles ahead. If the distance is not maintained for whatever reason, the car automatically eases up on the throttle and, if necessary, slight braking power will be applied. In extreme situations, an audible alarm is activated and a warning light appears on the dash. The COMAND system, one of many impressive standard features, combines a variety of technology and convenience offerings at your fingertips. A GPS (Global Positioning Satellite) system features a 4.7-inch display screen and combines regional maps from special CDs with real-time traffic and driving situations. Maps can be zoomed in or out, and a friendly voice offers suggestions on when and where to turn. Keypad controls along with multifunction controls on the steering wheel allow you to easily operate the Bose sound system and optional voice-command telephone. Another key feature is the impressive TeleAid System. Much like the OnStar system, TeleAid offers three instant service buttons for real-life responses. The "SOS" button immediately reaches an operator able to dispatch emergency services if needed. If the airbag deploys, the car automatically contacts emergency help with the car’s location and description. The other buttons include a "wrench" design, which puts the driver in contact with the Mercedes-Benz Roadside Assistance office, and an information ("i") option, which connects you to a friendly M-B operator able to provide you with all sorts of miscellaneous advice and information. But be prepared: As we were quizzing the "i" operator on our quickly changing location and specifics of the car we were in, the voice on the other end told us exactly how fast we were traveling! Like similar communication systems, TeleAid is only operational in areas that are served by cellular service. Advanced Climate Control, another Star Trek-like feature, uses sensors in the seat belt buckles to determine how many people are in the car and their exact seating positions. Between two temperature sensors inside the vehicle and an outside sensor in the front grille that measures the angle of the sun, the whisper-quiet air conditioning system should perfectly cool the car and keep all of the occupants contented. If that’s not enough, optional rear-passenger temperature controls are offered. All the smart technology on the new S-Class is welcome, but it’s likely to be the cruise control that will come in handiest most often. Between the ultraquiet interior, smooth ride, precise steering and awesome handling, the new S-Class feels so much more nimble than the previous edition that it’s like driving another class of sedan entirely. Our 400-mile introduction through winding mountain roads made the S-Class appear flawless. Despite its myriad technologies, the S-Class’ inherent strength shines through. While it won’t be mistaken for a sportier E-Class sedan, the new S-Class strikes a much better balance between luxury and technology than ever before. Mine is an Australian delivered S320 so it's performance may be a bit down on the U.S. equivalents with larger engines but, apart from this, it's awesome !